The state of Washington provides workers' compensation or workman's compensation benefits to workers who have been injured at work while they are performing their job duties. Workman's compensation benefits can include paid medical care for expenses related to the Washington work injury, lost wage compensation, vocational rehabilitation and survivor's benefits (if the worker dies as a result of their work injury or occupational illness). Work compensation in Washington has eliminated the right of the worker to file a personal injury claim (in most conditions) and instead provides immediate benefits. This is considered a trade-off for the worker, who may forfeit some compensation, but who does not have to waste time and money filing a personal injury claim. Washington workers' compensation can also benefit the employer, who is now required to pay for the no-fault insurance for each employee, but who avoids a protracted legal battle and does not have to prove it was not their negligence which caused the Washington work injury. Workers compensation was implemented in the state of Washington in 1911. 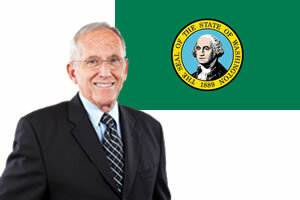 Washington's industrial insurance system, state government, (through the Department of Labor and Industries (DL&I)), is both the administrator and the insurer of the Washington workers' compensation system. Washington work injury lawyers have helped thousands of claimants get the benefits they need to return to work. Many injured workers can settle their Washington work comp claims without legal help, but if your work injury is serious or has caused permanent injury, or if you have been injured by a third party or product, you may need legal help. Work comp laws in Washington vary from other state's laws, and workers are not required to hire a work comp attorney to file their claim. Workers can apply for work comp and navigate the entire process on their own, but keep in mind that employers and their insurance companies will have their own work comp lawyers working for them. Washington work comp attorneys understand how to navigate the system and can ensure you get the benefits you deserve. Need legal help getting benefits for your Washington workers compensation case? Simply complete our free form below to get started today! Most work injuries which occur while a worker is engaged in normal business activities are covered under Washington work comp laws. There may be exceptions if the worker was intoxicated when they were injured, was attempting to injure themselves or another person, was travelling to or from work or they flagrantly disregarded a standard safety procedure. Medical benefits - Medical benefits are given to Washington employees who suffer a work injury. Medical benefits are provided for all necessary and reasonable medical care and can include: hospital, surgical, doctor, pharmacy and other health care services. Medical services can also include medical supplies and prescribed medication. Washington workers' compensation will pay medical bills until the worker reaches their maximum medical recovery. Unlike many other states, Washington employees have the option to make their own choice for their treating physician. Time Loss Compensation - Time loss or wage loss compensation may be provided to Washington employees who are injured and unable to return to work. The first 3 days of missed work are not compensated, unless the worker misses a total of 14 days. This period is considered the "healing period". Time loss compensation is paid every 2 weeks until the treating physician releases the worker to return to work. Time loss compensation is paid at 60-75% of the worker's total wages, up to the maximum outlined under Washington workers' compensation law. Temporary Partial Disability Benefits (TPD) - Temporary partial disability benefits may be paid to workers who have been injured at work and are able to return to work but because of their work injury they must work a modified work schedule. If a worker is unable to make the wages they could make prior to their work injury they may qualify for TPD benefits. Vocational Rehabilitation - Vocational rehabilitation services may be offered to Washington employees who are injured and unable to return to their job. Vocational rehabilitation services may vary by state but generally include: job assessments, counselor assistance and re-training to help the employee re-enter the workforce. The goal of vocational rehabilitation benefits is to help the worker return to full employment as soon as possible. Vocational rehabilitation is provided in Washington for up to 52 weeks with a maximum benefit of $4,000. Permanent Total and Partial Disabilities Benefits - Permanent total disability benefits (PTD) are paid to workers who are injured at work and who suffer a work injury or occupational illness which is so severe that they are unable to return to any type of employment. PTD benefits are calculated based on a percentage of the worker's wage (generally 60-75% and subject to the state's minimum and maximum allowable amounts). Other factors included in the calculation are the number of dependents and whether the worker is married. PTD benefits can be paid for the duration of the worker's life but can be offset if the worker receives Social Security Disability benefits. Permanent partial disability benefits (PPD) are paid to workers who suffer some type of permanent loss and may be able to return to work. Loss of an arm, leg, fingers or toes may qualify a worker for PPD benefits. The insurance company will calculate the benefit based on the percentage of the physical impairment. Survivor Benefits - Survivor benefits are paid to the beneficiaries of the deceased spouse. Immediate benefits may include compensation of 100% of the deceased employee's average monthly wage and burial expenses up to 200% of the average monthly wage. The spouse may also get monthly payments that are equal to the deceased worker's wage replacement amount. The spouse may lose benefits if they remarry but may be entitled to a final lump sum benefit payment. Children, who are under 18 or 23 if they are attending school, are also eligible for survivor benefits.